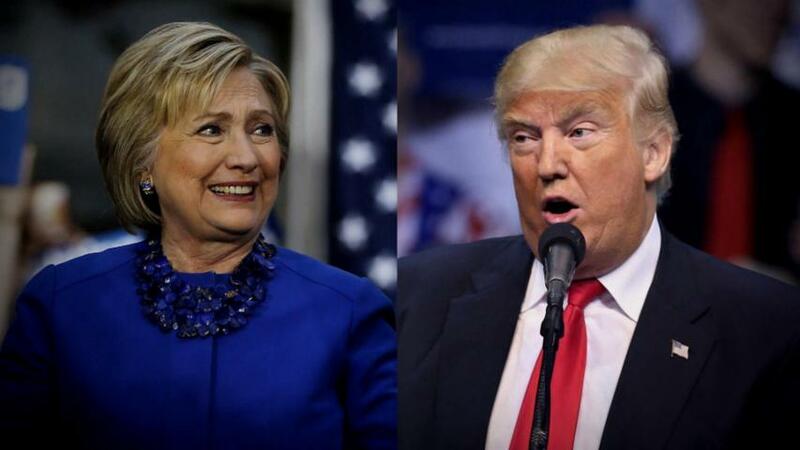 There has been a significant shift over the past several weeks on the question of which Republican candidate would do better against Hillary Clinton in the general election, according to a new NBC News|SurveyMonkey Weekly Election Tracking Poll. Donald Trump has narrowed the gap on the Democratic frontrunner: In a theoretical match-up, 43 percent of registered voters would support Clinton and 37 percent would support Trump. The tracking poll was conducted online from April 25 to May 1 of 14,640 adults aged 18 and over, including 12,462 registered voters. Ted Cruz, meanwhile, received just 30 percent support when pinned against Clinton, who got 44 percent support. While Trump and Clinton are only 6 points apart, Cruz is 14 points behind Clinton in a theoretical match-up. Compared to a few weeks ago when the Republican candidates had similar margins against Clinton, Trump has gained ground in the match-up against Clinton, whereas Cruz has lost momentum, suggesting that perhaps voters are supporting Trump as the Republican Party's potential nominee more than they have in the past. The poll also found that following Trump's landslide primary victories last week, his support among Republican and Republican-leaning voters nationally is up 6 points. 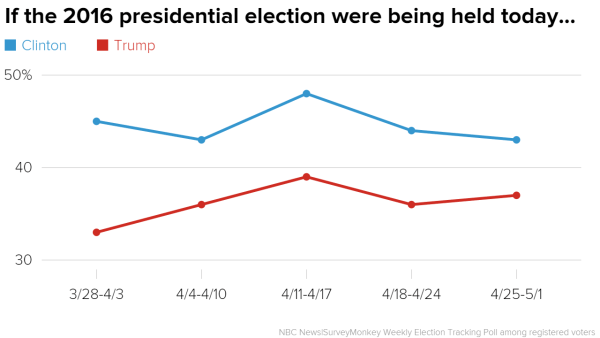 Trump has hit 56 percent support, his highest yet in the NBC News|SurveyMonkey Weekly Election Tracking Poll. As the primary season winds down, Trump has gained more support from Republican leadership, and Trump's spike appears to be a sign that Republicans are beginning to rally together to support the front-runner. Support for Cruz and John Kasich is down this week. 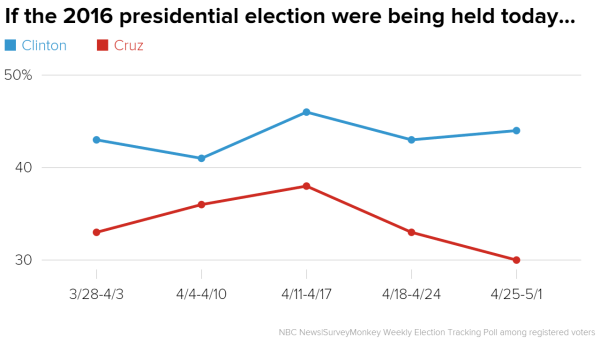 Cruz has 22 percent support, down 4 points from last week. Kasich has 14 percent support, down 3 points, according to the tracking poll. 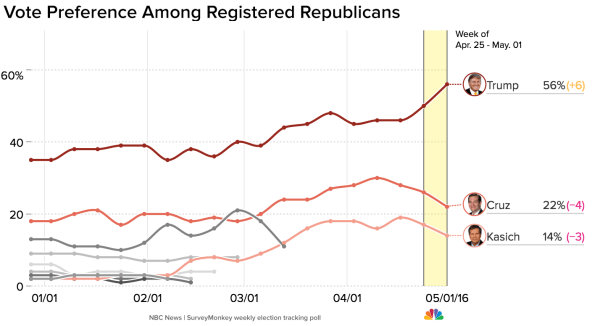 The NBC News|SurveyMonkey Weekly Election Tracking poll was conducted online April 25 through May 1, 2016 among a national sample of 14,640 adults aged 18 and over, including 12,462 who say they are registered to vote. Respondents for this non-probability survey were selected from the nearly three million people who take surveys on the SurveyMonkey platform each day. Results have an error estimate of plus or minus 1.2 percentage points. For full results and methodology for this weekly tracking poll, please click here.